The extreme left is desperately trying to instigate a civil war, and prominent left-wing “leaders” are fueling the fire. This is one reason why we fight so hard to defend the Second Amendment. In 1765 we opposed a tyrannical government. The combatants have changed, but we are again fighting a tyrannical government. 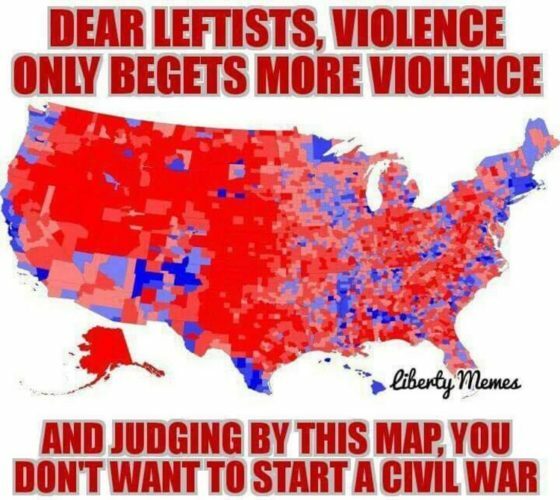 Let's hope Trump can win without a civil war. Consider this, they want a civil war with the population that believes in the 2nd amendment and isn’t afraid to use it? Sounds like a rational democrat plan. What interesting to me is that she basically saying, "Give us back our power and then we'll be civil." We know that is a lie and a promise they'll never keep. Ambassador Stevens could have told us a lot -regarding her lust for power and her disregard for human life. What she is actually saying is if Dems don't regain control, they will become even more violent. Which is actually the goal, create the chaos, then govt fixes chaos, then citizens hand over their rights one by one to keep chaos from happening again.